Considering a career in developing a renewable and clean energy source? 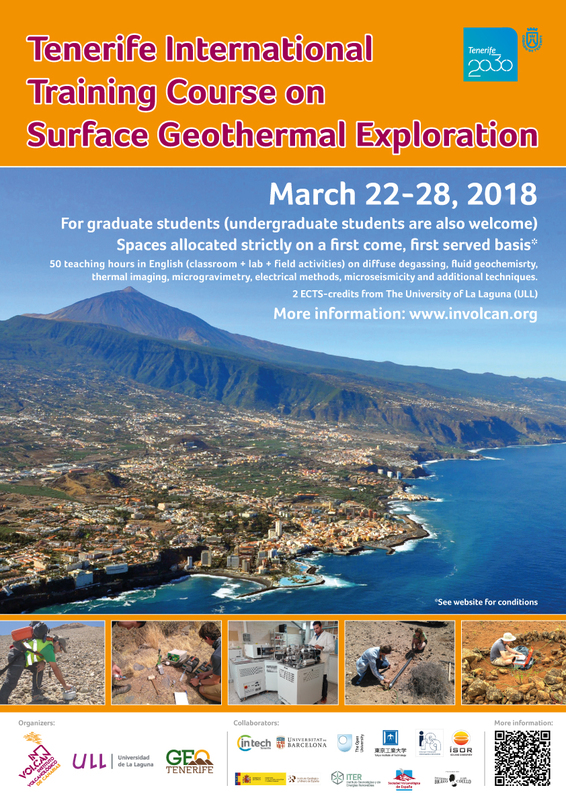 GeoTenerife is delighted to co-organise this week-long surface geothermal exploration training course with the Canary Island Volcanology Institute (INVOLCAN) and the University of La Laguna. There are a maximum of 40 places available, which will be granted on a first come, first served basis. The course is aimed primarily at earth science graduate students, but PhD students and Postdocs are also welcome to apply. The week will include 50 teaching hours and participants will earn 2 ECTS from La Laguna University. All teaching and materials will be in English. The aim of this course is to introduce graduate students to geophysical and geochemical methods used on surface geothermal exploration by alternating lectures with practical laboratory and field activities. Lessons will be given by researchers having an international scientific background and first-hand experience on Geothermal Exploration. The prerequisites for attending this course are skills in Earth Sciences, as well as knowledge of Mathematics, Physics and Chemistry. from the hotel is after breakfast, no later than 10am on 29th March. Participation on the course implies acceptance of our Field School Terms and Conditions published on our website. Failure to abide by our T+Cs could result in you being excluded from the course with no refund due, and obliged to make your own arrangements to return home. We are strict on this issue for a very simple reason – our T+Cs are designed for your safety and to maximise learning potential for everyone on the course. and your place will not be confirmed until your payment has cleared. We will offer scholarships to attend this training course. In order to apply for a GeoTenerife scholarship, please send an email to enquiries@geotenerife.com and write 2018 GE GeoTenerife Scholar in the subject line of your application. Please send a cover letter outlining why you deserve a Geotenerife Scholarship and an academic CV to support your application [more information below]. enquiries@geotenerife.com and write 2018 GE Scholar in the subject line of your application. Please send a cover letter outlining why you deserve a Scholarship place and an academic CV to support your application.